Monitor Audio is one of our long-term partners, and accordingly, the fourth generation of the Gold Series has been an integral part of our loudspeaker range since its launch in 2014. We are pleased to present the Monitor Audio Gold Series 5G, both in-store and in this article. Even in the latest version, the Gold Series has loudspeakers for just about every situation. First, there is the compact loudspeaker Gold 100, then the two floor standing loudspeakers Gold 200 and Gold 300 and then the variants Gold FX (dipole/bipole loudspeakers, also interchangeable), Gold C250 (center loudspeaker) and Gold W12 (subwoofer), which are designed especially for home cinema applications. 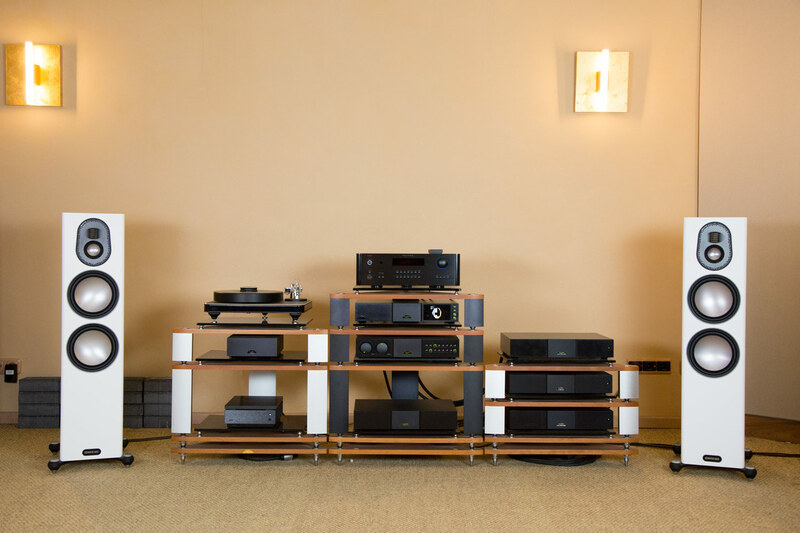 All models are available in a total of four surface finishes – black (piano lacquer), satin white, ebony (piano lacquer) and dark walnut – and, apart from the subwoofer, have a soft-touch surface on the top of the cabinet. The chassis sits in their own chambers, which are generously equipped with an insulating material. Only the highest quality materials and components are used for the cabling and the crossovers. The foot construction of the floor-standing loudspeakers has changed considerably compared to its predecessors, but also offers absolutely secure support in its new form, with or without spikes. 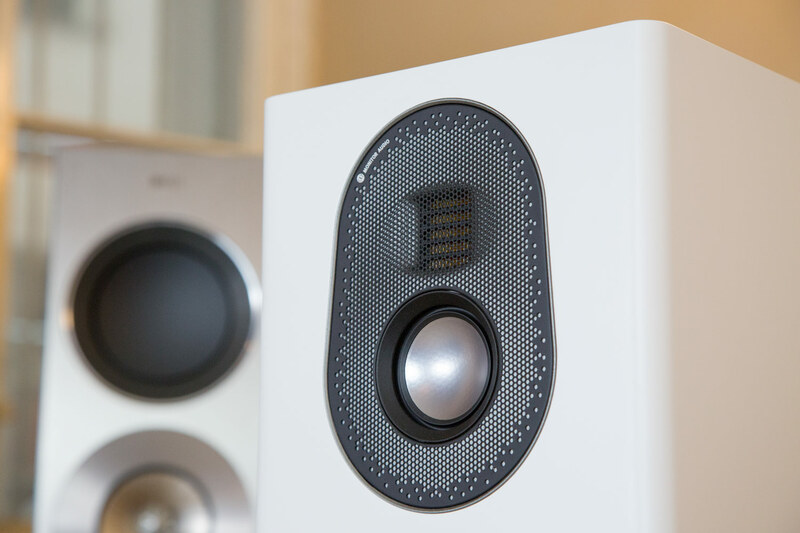 The MPD tweeter (MPD stands for “Micro Pleated Diaphragm”) is a technology that is less common in comparison to the typical dome tweeter, but Monitor Audio has already gained a lot of experience with this principle – for example with the high-end Platinum II series. At first glance, the suspicion is obvious that you’re dealing with a ribbon-like its predecessor, but the “high-frequency accordion”, as Monitor Audio once called the driver itself, is evident. The foil membrane is folded, the sound is generated by minimal changes in the spaces between the sheets. 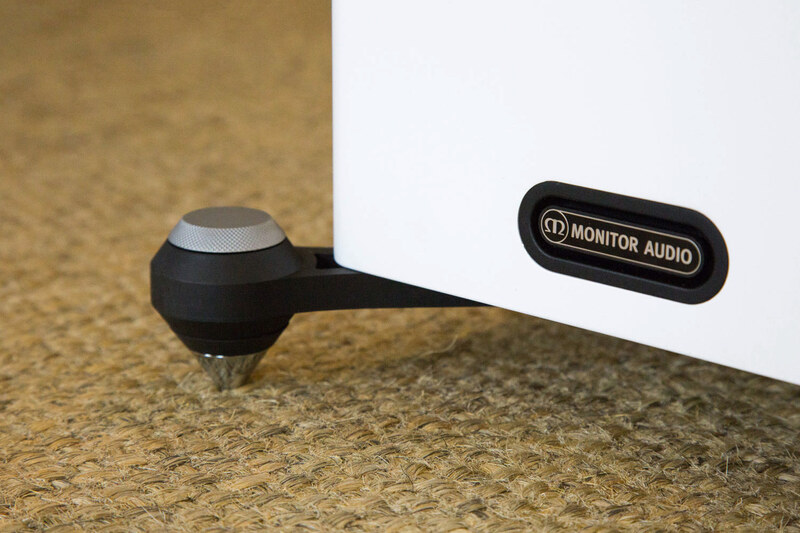 Originally known as the “Air Motion Transformer”, Monitor Audio has further developed the concept and tuned it for high performance. The result is finely drawn, pulse-fast and distortion-free highs. 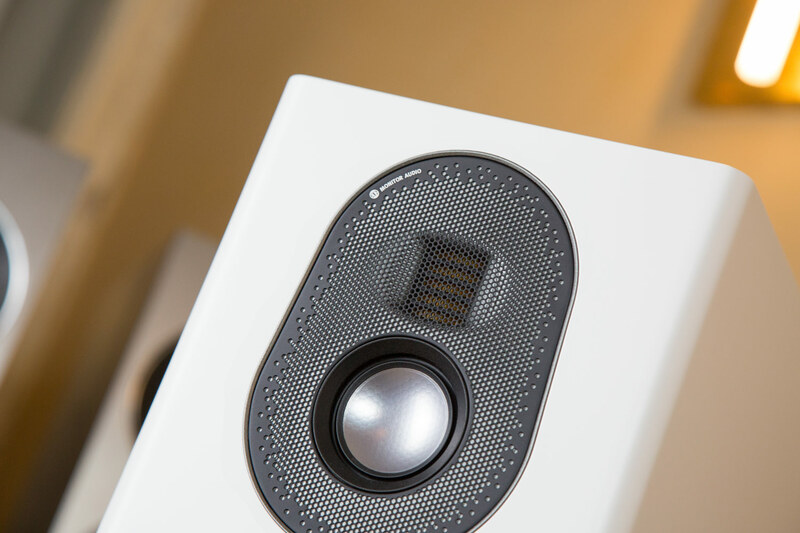 The two floor-standing loudspeakers each have a dedicated midrange driver. This is where a real classic from Monitor Audio comes into play: the C-CAM driver. The diaphragm is made of a ceramic-coated aluminum/magnesium alloy so that an extremely high material stiffness is achieved with an extremely low weight. The Monitor Audio team has literally added one or two more scoops to the woofer drivers, and in this case the Gold models also benefit from the Platinum II series: the membrane described above is complemented by a further layer of woven carbon fiber, and the two layers are connected by a honeycomb structured Nomex core between them. That sounds like a lot of material, but in fact, we are talking about a membrane only two millimeters thick, whose acoustic properties have been significantly improved by the composite structure. The entire system operates under the name “RDT II” (stands for “Rigid Diaphragm Technology”) and is also used in the compact Gold 100. Monitor Audio loves these abbreviations, there are a few more to mention. We don’t want to push it too far and just point out another element, which again comes from the big Platinum II series: The so-called Dynamic Coupling Filter serves as a connecting element between the voice coil and chassis and ensures that the driver works as exactly as possible in the intended frequency range. Up to the cut-off frequency, the component remains rigid at first, while the filter material reacts and effectively dampens excess kinetic energy. In addition, the perforation of the structure ensures heat dissipation on the one hand and air pressure compensation behind the chassis on the other. Apart from the tweeter, these are screwed to the rear by means of threaded rods, so that they are absolutely stable in the cabinet and do not require any further screws on the front of the cabinet. To ensure that it ultimately remains completely flawless, the designers have opted for a magnetically attached covering. In addition, the Gold Series speakers are equipped with one or two bass reflex channels on the rear, which can be prepared as required with the supplied plugs. 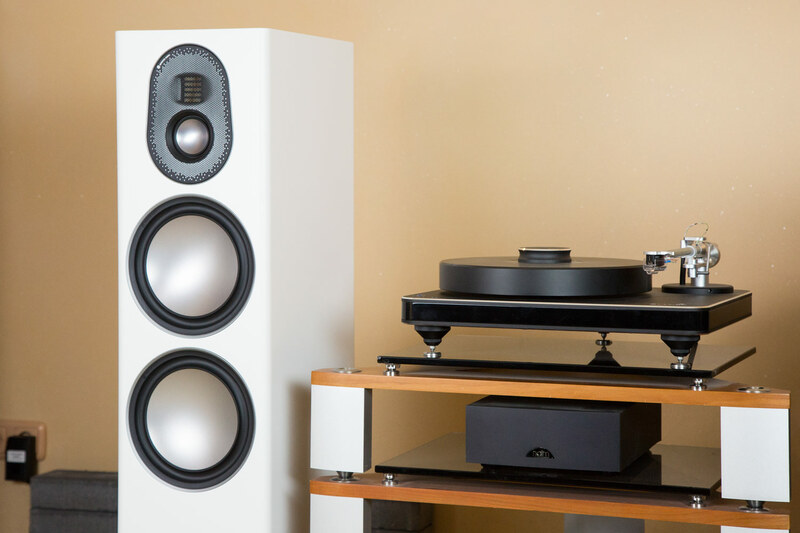 On the back, the attention to detail of these loudspeakers can also be seen elsewhere: the high-quality bi-wiring terminal is equipped with two slightly curved bridges that elegantly embrace the name of the loudspeaker. With the new Gold 5G models, the traditional British manufacturer has succeeded in creating a well-thought-out loudspeaker series from front to back that picks up on old Monitor Audio trademarks and develops them further – with audible results. We are looking forward to further testing the loudspeakers in the coming weeks and months in various scenarios.